Skin care I’m packing for a summer holiday. Next week I am off Greece and Italy but NOT Iceland, for those who keep asking. It will be warm but not violently hot, we will be swimming a lot, and I will eat tonnes of feta. All of this thrills me. I used to pack 74329 cosmetics and toiletries for these trips; there would be a bag of face skin care, one for body, one for hair, and one just of makeup. I would take a tong and my ghd, as well as several brushes. And there would STILL be space for one bikini and my passport – amazing! These days I have streamlined it considerably, in large part due to my own skin care line being so dang perfectly useful (which is why I made it), and having a baby whose accoutrements soak up most of my packing space. D) less stressful than actually packing them. 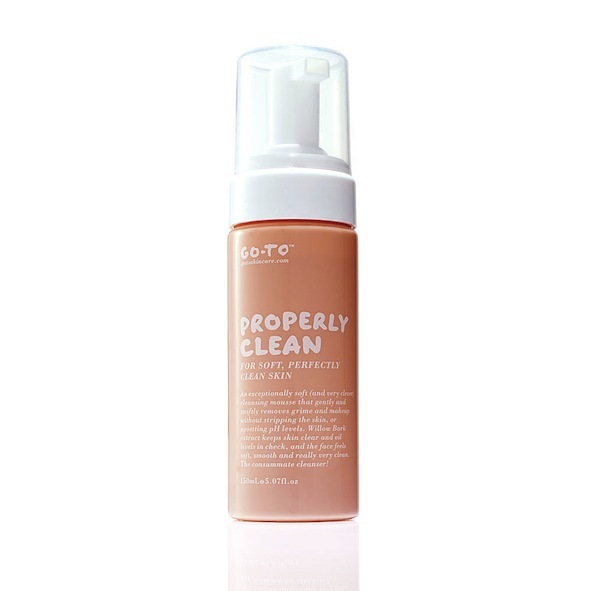 1 x Go-To Properly Clean cleanser cos it takes off all my makeup and sunblock real good. One full bottle will get me around 30 days. 1 x SkinCeuticals Phloretin CF antioxidant serum to wear under sunblock each day to help prevent UV damage and premmo ageing. This anti-oxidant step (onto clean skin, first after cleansing) is important. We should all be doing this every day, in my opinion, holidaying or not. 1 x Invisible Zinc SPF 50+ water resistant physical sunscreen to wear on top of serums to thoroughly, physically protect my face and neck, even while swimming. I will make husband wear this every day also. Here are my thoughts on physical vs chemical sun protection. 1 x Go-To Very Useful Face Cream to wear at night because it’s lovely and hydrating and full of antioxidants to heal any UV damage I collected somehow through the day, and halt the free radical damage that occurs for up to 72 hours after sun damage, NOT that I would ever get any of course, cos I am a wild control freak about that and wear big hats to prove it. 1 x Go-To Exfoliating Swipeys… except I am just taking a little stack of them in a re-usable makeup jar for space saving. Being a thorough, chemical exfoliant, this will give my sunscreened skin a deep clean every few days, and you really want that, trust me. 2 x SK-II Facial Treatment masks as well as sample sachets of Elemis Fruit Active Rejuvenating Mask and Dermalogica Skin Hydrating Mask for a hydrating boost every five days or so. Full size tubes and jars of mask are way to big and space thievey for me. I will buy my body sunscreen and body lotion and after sun (full of antioxidants like vitamin E at the least) stuff over there cos they’re way too heavy and space consuming to pack at this end. Also, I bloody love an overseas pharmacy visit. Last time I was in Mykonos I found a bruise healing cream that, to be crude, defecated all over Hirudoid in terms of effectiveness. No, I did not bruise myself dancing on tables, how dare you. I was dancing on a podium obviously.